Our friend Jorge owns the nearby tienda that Todd and I frequent (“Bandito George”). We have become quite fond of Jorge over the years, and he has been a good friend to us too, along with his oldest son, Teo. Jorge is a hustler, and he works hard. In the last year, he has also opened up a cabana on the playa (we call it “Jorge’s on the Beach”) where he does a booming business during season selling snacks, renting beach awnings, and offering fresh coconuts trimmed, punctured and “strawed” for the juice; he will then carve and bag the coconut meat when customers are finished with their drink. We often go there to share a nice frosty beer or two at noon time (and when Jorge’s at the Beach is closed, we park ourselves outside his street-side tienda). It’s kind of become pleasant routine after our morning work is finished; it’s a time for Todd and I to go over our plans/agenda for the rest of the day. Typically, a few other local Ecuadorian neighbors are hanging around too. Often Jorge’s 8-year old outgoing granddaughter Mallory is around. She is smart as a whip, has a great desire to learn Ingles, keeps a notebook to write her new words in, and so she and I practice simple words together when we can. When my brother Jack is in town, he has embraced our noon ritual and mentioned in a recent email that he missed having beers at Jorge’s. One local that often lingers around Jorge’s is “Lorenzo” (very friendly, but of dubious gender – and I don’t mean this meanly. To further confuse the matter, Lorenzo has a similar sibling – we think a twin – and it’s easy to confuse the two). Todd and Jack and I usually sit around telling funny stories and laughing a lot during beer-thirty, and Lorenzo always enjoys these conversations, though he doesn’t speak a lick of English. Occasionally he pipes up with a comment, though we don’t understand him any better than he understands our chats. He’s taken a shine to all of us, but especially my brother, and every time Jack would laugh, Lorenzo would heartily laugh along, which sent us all into further fits of giggles, Lorenzo included. Fond memories and fun times. A couple of nights ago, Todd and I bought a bottle of rum from Jorge. When we later opened it, we noticed that the lid wasn’t sealed as usual. As we were pouring ourselves a couple of drinks, we also realized it smelled nothing like rum, but more like “cana” (the cheap sugar-cane based liquor popular here, but given the concern over the tainted and deadly alcohol incident in the Los Rios province lately, we weren’t taking any chances and tossed our drinks down the sink). We returned the tampered rum bottle to Jorge the next day, who graciously replaced it with an unadulterated bottle of new rum. The most interesting thing was that he then proceeded to put our opened and quarter emptier bottle back on the shelf…I don’t suppose it’s likely he has any type of “return authorization” policy with his vendors, and more than likely he will re-sell it again to some less picky local at a discount. I might add that I’ve noticed in the past a few stores around here with bottles of alcohol, or cola, or water that seem “less than full” on shelves or in fridges, and I generally scrutinize before purchase, but that night we were in a hurry to get to a party. We’ve been quite the social butterflies lately and it seems like every other night one of our friends is giving a dinner or a party or inviting us over for cocktails. It’s been fun, but frankly I’m getting sorta worn out…. Part of getting older, I guess. A little over a month ago, Todd and I went to the 4th Anniversary of the Montanita Spanish School and a birthday tribute/memorial to Warwick (“Waz”) White, founder of the school. Waz (a New Zealander) died almost a year ago in tragic accident in an eastern European country shortly after participating and placing (winning?) with an Ecuadorian team in a triathlon type competition. Waz was a great guy, a friend of ours, much respected around here, and one who is still dearly missed by many. His sister Jacqui has since moved here to over-see his affairs, along with her three adolescent/young adult kids. She’s a great gal too, works hard, and has become a friend of ours as well. We’ve also had more of an opportunity to spend with Ladd & Marilyn (and Dallas, Ladd’s mom) from New York State during their month stay in nearby Curia. Such fun people! They’ve been looking for Ecuador property and aside from their time here, they also explored Quito and Cuenca and surrounding areas. While they were on the coast, they took a number of side trips and we believe their hearts have been captured by the Bahia/Crucita area (about 6 hours north of us) and we’re happy to think they will eventually migrate to Ecuador. They left yesterday morning for a few more days of exploration in the Banos region before heading back to the States. On their last night here, they invited us to their Curia place for cocktails and dinner, and we had a wonderful time with them. We had a chance to see a number of pics that Ladd has taken (a talented photographer and author of a fledgling and promising blog called “Next Stop Ecuador”). One thing I forgot to mention in my last post about them – they very thoughtfully brought us a few things we’ve been craving, I suppose from reading this blog, since we didn’t specifically solicit these items, but I very nearly fell at their feet when they presented these to us (see pic below). I feel safe to say that all of us expats living here regularly, unashamedly, and perhaps promiscuously send wish lists to all of our friends and visitors coming to visit, but L&M unexpectedly brought these goodies, and we are ever so grateful. How they managed to get the Jimmy Dean sausage down here in good shape, I still can’t figure out, but I have died and gone to heaven now. A couple of nights ago, Todd and I attended a baby shower for TJ and Whitney of Casa del Sol, who are expecting a baby boy next month. Their/our friends are a little bit younger bunch than us, but probably the crowd we count as our closest friends. All have been here as long as or longer than us, trying to make a living – not retired – and just a great group of amigos; a nice mix of expats and locals. Hell, most of them are the same age as my kids (in the early to late thirties age bracket) and more of them are enticing their parents (our age) to join them living here too, so it’s become more and more like a “family” group of comrades. The “kids” party late while us older folks eventually tiptoe off to bed or a quiet game of cards by 11:00 PM. (A big shout out to Judy – if you are reading this. She is our young friend Leslie’s mom, who is temporarily back in States. Hurry back). Tonight we attended the 10th birthday party of Polette (“Paulett”/Paula), daughter of Susana (the “esposa” of our long time, four year friend German Mike). We are particularly fond of Polette, especially since we lived next door to them for nearly 5 months in a rented apartment during the Dec-Mar busy season last year while our beach house was booked with vacationers). During that time, I taught Polette a game my siblings and I used to play growing up, called “Gotcha”….This is a version of “tag, you’re it”, but instead of punching someone on the arm, you stick your tongue out at them…The idea being that you don’t want to be the last one to see a tongue stuck out at you last, or you are “it”. My siblings and I were great at doing this at the dinner table, which would alternately either annoy or amuse our parents, and we came up with some very surreptitious techniques to “get” each other at mealtimes. Even now, as middle aged folks, we still do this when we are together, and I taught it to Polette, who always plays it with me now. She in turn shared it with some of her young friends, and the birthday party tonight (which is very big deal here with lots of food, games, decorations, music and 10-yr old kids dancing) did kind of evolve into a “gotcha” marathon. Having mojitos on "Bar Alley"
Forget the sorta political “coup” of President Correa last fall; forget the tsunami scare after the Japanese earthquake; forget that the power has a tendency to go off at the most inconvenient times, and internet connection can be incredibly slow with the thumb drive device we use at home – a REAL crisis has developed now…A 72 hour ban on alcohol sales was implemented country-wide in Ecuador this week because some home-made/small brewery methanol tainted hooch has killed around 24 people so far (mostly in the Los Rios province). Not that that has actually stopped liquor being sold around here. Yes, most of the sugar cane based liquor has been pulled from the shelves, and it certainly has put a damper on the on-going party in Montanita, especially in the on-premise drinking locations (restaurants and bars). “Bar Alley”/”Cocktail Lane” is shut down until Friday. We have been able to buy liquor “to go” (though we have to discreetly purchase and hide in plastic fundas/bags for now). And we’ve had no problem purchasing beer (to go). The other developing crisis is that my hairbrush (cepillo para el cabello) broke today (handle broke from the brush part). I scoured all the Montanita stores (tiendas) esta noche to replace, without success and have a sneaking suspicion that I will have to head to Libertad to replace. brought along his own blender. One of the greatest things about living in Olon/Montanita area is the opportunity we have to meet so many interesting, adventurous, international and local people. Generally most visitors are here on vacation, or to look at property, and – the younger crowd, in particular – are just “traveling around South America”. The backpackers that come through here are some of my favorite folks to chat with (however briefly) as they pass this way. Meeting new people is never uninteresting for me. Recently we’ve had the pleasure of meeting a number of visiting gringos. Bill and Colleen Baker from B.C. were here a couple of weeks ago and the four of us headed to Ayangue (“Lobster Village”) for a little sight-seeing and lunch one day. It was fun being “tourists” ourselves for a change. Ladd and Marilyn (from New York) along with Ladd’s mom Dallas are here for a month, staying in Curia at the home of one of our friends (who lives in Iowa). Like the Bakers, they are here looking for property. We had dinner with them a few nights ago, and are looking forward to getting together later this week for happy hour. Ladd and Marilyn recently started a new blog called “Next Stop Ecuador” and some of Ladd’s observations on the blog had me laughing out loud. Another gal, Tami and her family from Alabama are spending time along the coast and she and her son spent a day in Montanita. Unfortunately, I wasn’t able to meet up with her, but she and I had a fun chat on the phone. She works for a wine and craft beer wholesaler (I worked for Orange County Budweiser for ten years), so we had a lot in common, and know we would have had a great time over a couple of mojitos in Montanita. 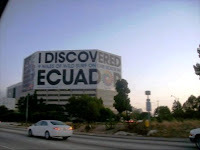 She also has just started an entertaining Ecuador-themed blog called “Tamster’s Travels”. Additionally, we’ve been spending quite a bit of time this week with Karl Neumann, a Peruvian of German decent who lives in Florida. He has done his homework, and is in the process of buying several properties in Olon (one of them is a lot in our Jardines de Olon neighborhood, next to Randy and Fonda’s house). Interestingly, his great, great grandfather Antonio Neumane composed the current Ecuadorian National Anthem (“Salve, Oh Patrio”). The song premiered in August of 1870 in Independence Square in Quito with Neumane as director. Karl himself has written 40 books in Spanish regarding small business start ups, mainly published in Mexico. Our dog Daisy has been moping around since the boys (my brother Jack and Doug) left. She hangs around their house waiting for them to return. But she has perked up recently because a wild beach stallion keeps managing to get into our compound lately through a gate frequently left open during the day. The horse likes to graze on our lot next door, which sends Daisy into a tizzy and we’ve had to chase him out of here 3 times in the last couple of days. On the other hand, Todd and I are starting to consider just letting him graze there for a few hours each day – easier than mowing it. Last week I was up at our nearby Oloncito Market (the local owners, Antonio and Patricia Zamora are friends of ours). I was hanging around there the other day, waiting for a chicken bus to come along. Patti and Tony have been diligently trying to learn Ingles and we regularly practice our Espanol/Ingles skills together whenever I am shopping at their store. A couple of days ago – for once – we had some forewarning of a scheduled power outage starting at 9AM. I’m pretty sure these events are probably broadcast over the town’s loudspeakers, but after a year here, try as I might, I still have a hard time understanding any announcement (“Como Se Dice?"). Todd and I were prepping for guests arriving at two of our friends’ homes, and I scurried around early morning getting several loads of wash done that HAD to be done before the guests arrived that day and the next. Todd dashed about taking care of his chores…..And then – alas – the power never did go out that day or has since. But by, golly – we were READY this time. The power will go out only when you are completely unprepared and at the worst possible moment (i.e. ; in the middle of a nice dinner party, or while eight loads of laundry waiting their turn on a short house turnaround, or during the middle of a “glued to your seat” DVD movie, etc). You get my drift. Really, by now I thought my Spanish would be better. And maybe it is, because lately our local friends have complimented Todd and I about our language improvements. Many here want to learn English as well, and at least along our area of the coast (Olon/Montanita), we are more often hearing English being spoken. No doubt this is because our area of the Ecuador coast attracts an international crowd of young (and older) folks passing through. I’m sure we would be much more fluent if we ever spent an hour a day or so doing “homework” together, but this inevitably ends in one of us stomping off in a huff, so we are learning by immersion. Interestingly, Todd, who has never (“nunca”) taken a lesson in Spanish in his vida (“life”), comprehends the spoken word here better than I do now. To me (four years of A+ high school Spanish) they sound like they are talking with marbles in their mouths along the coast of Ecuador. Todd is an “auditory” learner, has no pre-conceived notions of the language, and is learning like a child would. I speak Spanish better (albeit generally still in present tense), but Todd has overcome most of his shyness about speaking in Spanish (I think this phase is fairly typical for anyone learning a new language) and is progressing by leaps and bounds. Especially, together, we do pretty good...He is our ears (“las orejas”) and I am our mouth (“la boca”). Todd and I were up at Barb and Robert’s house in Curia working a couple of days ago. Their caretaker guardian Manuel and his wife Barbara were there too. Manuel and Todd were talking; I stepped outside for a moment, and entered back into the conversation a few minutes later. Evidently I missed a couple of crucial sentences. I thought they were talking about a “perro”/dog that Manuel enlisted/adopted to help guard the house…. Manuel emphasized that perro could not walk or “bark” –at least as well as I could understand…. And he wasn’t a very good eater either... I was thinking “well, what kind of guard dog is that”??? Fortunately, Todd saved me in time (once he realized I was somewhat off track on the translation) when he pointed out that the conversation was not about a “perro” but “Pedro”, our friend in the recent car accident (and Manuel’s brother-in-law). Those two words “perro” and “Pedro” (thanks to the local marbles-in-mouth accent) can sound very similar here, and the discussion was about Pedro’s recent return home in Curia, though his recovery is likely to be slow, but a blessing nevertheless that he is able to be home now, with his family. Spanish must really sound by now. An electricity bill comes in showing a June 5 generation date, a due date of June 20 but not delivered from utility folks until June 30. Maybe it's just me, but there really truly is a “catching a bus” jinx along the Ruta here…..No matter which direction you want to go (North or South)….guaranteed – GUARANTEED – you will see one or two buses (or cheap taxi’s*) heading in your desired direction before you can sprint across the Olon soccer field (or get waylaid at the Montanita bus stop bakery) before you can catch it, and have to wait sometimes around 15 minutes for the next one. This is especially true if you are in a hurry, need to go to the bathroom, or are carrying a very heavy load. My brother, Jack, who bought a home in Jardines de Olon (along with several other partners, and who introduced us to this area) was recently here for a couple of weeks, along with “Big Deck” Doug (married to Pam). He has been nicknamed “Big Deck” after a humorous night on their beach balcony, but also because one of the other partners is also named Doug, and we call him “Uncle Doug” to distinguish the two of them. Most of the locals around here refer to “Big Deck” as “Dooglish” (“Douglas”, and have much respect for him, as do we gringos). "Uncle" Doug doesn’t come here often, is a very private person, and loves lots of gadgets, electronics, and boy toys, which he brings and leaves here on his infrequent visits….It doesn’t help that ANOTHER expat gringo named “Doug” lives up the road just north of us and Todd and I call him “Georgia" Doug ...When we first met our expat friend Sitara ("Go for a Ride?") and she mentioned that her boss (based in North America) was also named “Doug”, I thought……”oh geez….we need another Doug around here like we need another “Doug”)….we are running out of “Doug” nicknames. ﻿﻿﻿Also in this last week Rocky and Elizabeth arrived from South Carolina. Their house is the southernmost (of three) houses directly on the beach in the Jardines de Olon. Beth has a huge heart towards animals, is very actively involved in animal rescue and sterilization in her hometown, and deserves all credit for convincing us to adopt Daisy a year ago. 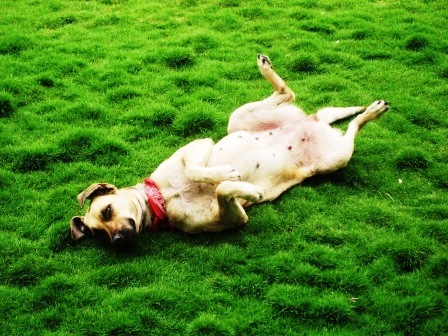 For both Todd and me, Daisy has been such a joyful companion to have along this journey. As “luck” would have it, the Proteccion Animal Ecuador happened to schedule a visit here ($10 to sterilize a dog / $5 for a cat) one day in our park while she has been here. That’s pretty darn, darn cheap. Quality medicos from Quito were here to perform the procedures. Interestingly, many locals were resistant to take advantage of this “cheap” opportunity to sterilize their animals. And not because of moral objections. While $5-10 may not seem like much to many folks reading this, that is generally more than many locals can afford for their pets. So Beth took it upon herself to offer not only financial assistance that day, but also walked the town with a local friend – going door to door – handing out flyers. This is about the second or third time each of the aforementioned family/friends/neighbors have made the trip here since December, and there are several funny stories about those trips that I will re-visit in later posts. * An “official” taxi from Montanita taxi stand to Olon (or calling for a driver pick up from Olon to Montanita, in particularly at night) costs $1.50 door TO door. On the other hand, we have discovered/learned that many “taxi’s” hailed along the road only cost the same as the 25 cent bus fee per person….It’s a little bit sketchy at first to figure out which are the cheap taxi’s, but generally the rule of thumb: the car is beat up looking, there are other people in it (being picked up along the Ruta highway along the way until everyone is crammed in) costs only 25 cents per person. I have never felt scared jumping into one of these alone (even at night and with only guys sharing the ride) Occasionally I suspect that one or two tires may be lacking tread and we are riding on the rims or the break pads are on the thin side. Fortunately most of these drivers go much slower than the maniac bus drivers. And almost without exception, these drivers are kind and friendly. Also an update on the accident victims mentioned a few posts back: all that survived are out of the hospital now, with the exception of Pedro from Curia. Pedro was one of our first local friends here four years ago, whom we met when he was driving a cab, and shared many a beer with us over the years, either at our place or his. He is still essentially in a coma, though making progress; however (as near as we can understand from his family, whom we also know, it sounds like he may be in a wheel-chair for the rest of his life, if he makes it that far). That is going to be a huge hardship on their family, as well as a couple of other families whose main caregiver died in that calamity.